Writing this weblog, I have worried that people will take what they read the wrong way. How so? Well, someone could think I’m disrespecting poverty, or their own struggle, or saying that everyone should be like me. None of those things are true. In a way, I’ve been waiting for someone to play devil’s advocate, so that I can think about my responses to criticisms and take them into account when writing. The right opportunity came along after a friend and I went on a day trip to London and happened upon “M&M World” – a terrifying 4 floors of M&Ms and M&M related products. The store took merchandising to new levels and was the most horrific example of extreme consumerism that I have ever witnessed. After exploring every corner of this morgue, as driving techno pumped through a surround sound system, we went outside to literally have a lie down in Leicester Square to recover. We then discussed the methods that M&Ms were using to get people to buy absolutely useless, cheaply made tat with their branding on it. Each M&M was made into a character, so that collectible ranges of mugs, clothes, bags etc could be made, in which people identified with the personalities each M&M. Bags of sweets and other items could be personalised or your message put on them. 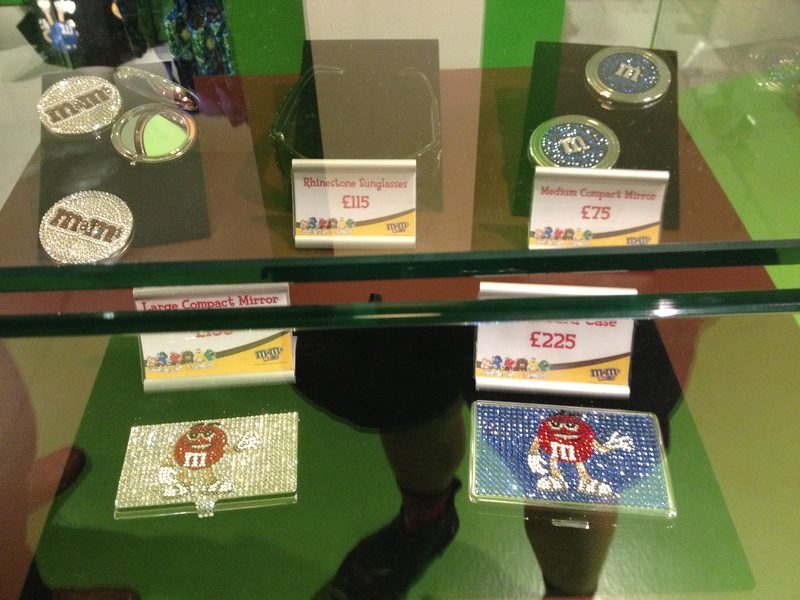 Items branded with “M&Ms London” would attract tourists wanting a souvenir. 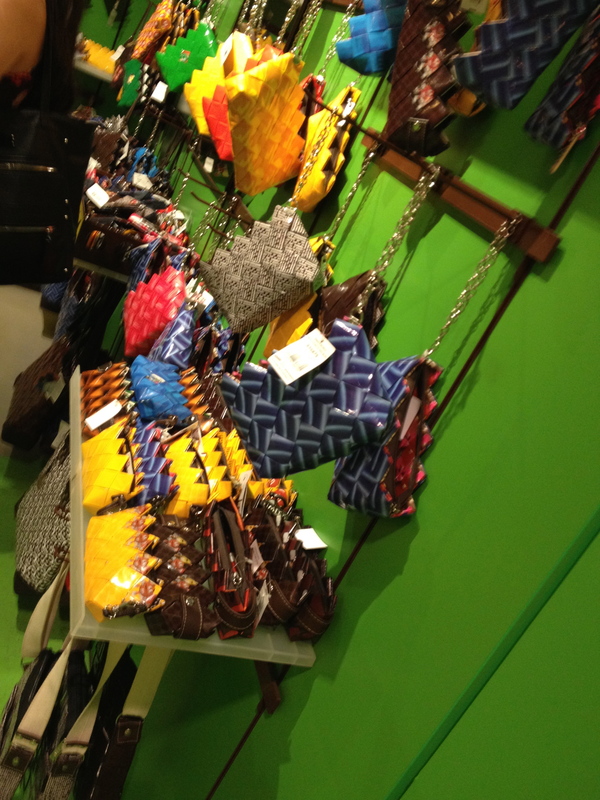 Bags made from M&Ms wrappers, presented as providing work for those in developing countries… but it all seemed suspicious to me. I was appalled that even as global awareness of environmental issues is higher than ever, a business is still willing to make so much useless crap and then encourage people to buy it. Worse still, people are falling for it – they are buying it! I realised over-consumerism is going strong (even stronger than I thought) and that it is the enemy. Repelled, I vowed to redouble my efforts to fight it. It was a strange moment. I could see that my friend was working on the erroneous assumption that just because I am throwing out many of my attachments to money and possessions, I obviously think everyone should be just like me. They also believed me to be of the opinion that if everyone woke up tomorrow & stopped over-consuming the world would be brilliant. First of all, of course that wouldn’t work because there would be no alternative systems in place. Secondly, I don’t think we’re in danger of that sort of thing happening – not unless everyone in the 1st world reads this paragraph today and make a big decision in the morning as a result. Yes, it would be great if I woke up tomorrow in a world without over-consumption, but that would be a fantasy world in which a less wasteful system was already up and running. If change is going to happen, the key is to build those alternative systems slowly until they become mainstream. I don’t know how to do that because I know very little about economics – that’s up to those of you who are have different skills to me and who are inspired to take up that cause. My part in the picture is simply to hope that this weblog goes some way towards inspiring you. The world will change for the better if each person on the planet is committed to changing it for the better. A commitment is really all that’s needed because then each person will take every opportunity to help make the world a better place, including the most difficult step: finding out HOW they can help. The information age actually makes it very difficult to find out the truth, so how can we know what to do? Which charity is the best cause? How do I buy food ethically? Should I join some activists? These are difficult questions, but I think that once someone’s desire to improve the world has become a driving force in their life then they will be devoted to seeking out the truth so that they know how to best help. One person might go to the 3rd world and build hospitals, another might simply decide to be kind to each person they meet, another might be in a position of power and decide to use it for the greater good. All these roles hold validity. The money system has become very perverse, especially in the west. I don’t believe that everyone should just give up money, but I do believe that everyone in the first world would benefit from re-examining their personal relationship with money. I’m not saying it will work for everyone but I do actually think that more people should try setting themselves challenges. Setting challenges for myself is my way of making sure I’m not blindly following the crowd. If I’m doing something that isn’t working for me me, even if everyone else is doing it too, then I’ll challenge myself to give it up. It’s scary but it’s worked so well for me. I can cut right through to the center of a problem and face it head on. I have now completely run out of money. I have no money in my pockets or wallet and my bank account reads £0. Now literally penniless, going busking will probably be my first step to working my way up from zero. How did I spend the last of my funds? Simple – the vansion needed fixing. The repairs (by a trusty local mechanic mate) cost me nearly all my remaining cash. I put some fuel in the tank, spent the final tenner on food and that’s it – no more money. So phase 1 is completed – deliberately letting my money run out. This process aims to let me confront my fears about money. Has it worked? Yes. Even phase one has taught me a lot of unexpected lessons. One realisation I had is that even without money I could make a great music video, with your help. If you’re interested in being IN that video, please visit https://www.youtube.com/watch?v=2XNDwS7wUwE and get involved!! There were also points at which I felt very afraid. I panicked in a restaurant with friends and couldn’t bring myself to order a meal, because it just seemed like such a waste of £15 to go out for food when I was so close to £0. I also refused to let anyone else buy me dinner because that ran against the spirit of the challenge. Firstly, over the past month I’ve learned to live happily on less money than ever before. I haven’t had to give anything up, I’ve just cut down on getting them by buying them. Secondly, I have more faith than ever in my ability to make my own way in the world. I no longer worry that I will starve or have to go without something that I need. Notice that I’m not using phrases like “making enough money”, or “earning a living” anymore. This experiment is already showing me that getting what you need to live isn’t necessarily about money, it’s about resources. So what’s the difference between getting what you need with money or without it? Well, the money system controls me because I need it to “pay my way”, or “earn my living”. The money system is controlled by bankers, businesses and a consumerist economy that’s wrecking the planet. So being less dependent on money is a way of being less controlled by that system as a whole. You see, the more dependent I am money the more time I’m forced to spend earning it, giving me less time to offer exchanges. Giving and receiving goods and favours forces us to have more contact with the community around us, which is great news in our individualistic, isolationist western society in which so many people are lonely. I had wondered if the £0 descent would leave me deciding to go moneyless, but it hasn’t taken me that far. However, I do sense that I have changed in some fundamental way and I won’t be able to go back to the way I was living before. Phase one has made me think twice about buying anything. If there’s something I need, I’d only buy it new as a last resort, because the options of exchange, reusing and wombling seem more ethical to me. One of my friends keeps telling me that the biggest problem facing humanity is overpopulation. I haven’t looked into this issue, but it sounds about right. We’re using up the planets resources and soon there won’t be enough for everyone. Not only that, the current population, especially the west, is constantly wasting what we have now. When’s the last time you wore through a pair of jeans, cut them into shorts, then rags, then used all the rags? The idea of it even sounds strange to most westerners. Most of us get rid of our clothes when they look a bit shabby or we’re bored of them. So every time I buy something 2nd hand, that’s good for the planet, but if I can take it from a bin, even better! There’s actually honour in going through rubbish and picking up things in the street. Found in the street or rubbish: Biros, elastic bands, cakes, noodles, rice, pancakes, cereal and milk, biscuits, buns, doughnuts, soft drinks (and many other high calorie foodstuffs), jumpers, t-shirts, flannel, guitar picks (made from someone’s old bank card), plastic water bottles to keep in the van, books. Traded for: Food… I haven’t had much luck with direct trading. It seems that give and take doesn’t work out in neat transactions without money. Borrowed: Hairbrush, towel, books, straw hat, houses and flats (housesitting). Was given: Laptop bag (3 days after mine broke), carubina keychain (1 week after mine broke), foam mattress for the van, ripped jogging bottoms (I made the legs into tube-scarves), stick of deodorant, toothbrush, food. The key factor however, has been learning to wait. If something of mine broke, or I needed something new, normally I’d just go out and buy it. Waiting to find an alternative usually took only a few days. I struggled the most with the concept of borrowing. Normally I would buy something even if someone was willing to lend it to me, because I’d worry so much about breaking or losing the thing. Housesitting has forced me to simply get over it – I haven’t broken anything in someone’s house yet so it’s obviously not as likely as I’d feared. So what will I do now? Will I launch into earning lots of money or will I choose to scrape by day by day? BTW: This post has been posted a little late. The actual date that I ran out of money was June 18th. Watch this space to find out what I did next? Will today be the day I completely run out of money? …oh no! The van is faulty! Now’s the time to face that fear. Everything’s going wrong! 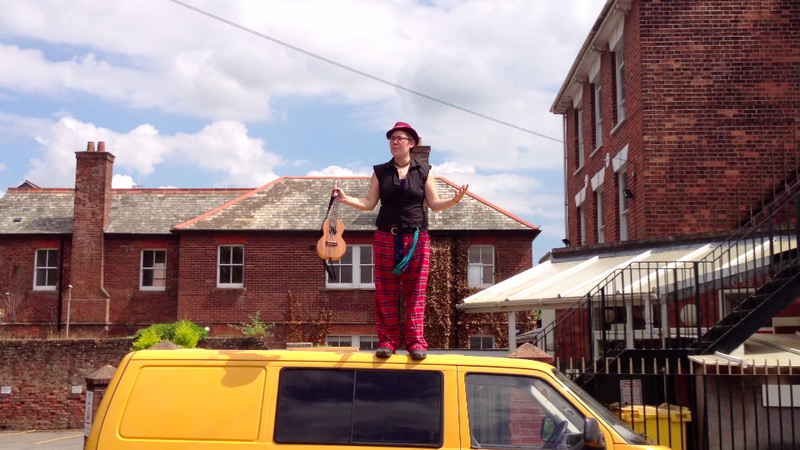 The van is faulty and my guitar has shrunk in the wash! The rules of the challenge state that I must let my bank balance run to £0 before I can chase work. I can accept work if offered, but I can’t seek it – mimicking what would happen if my self-employed business ran dry. After that, the aim is to work up from nothing without begging, borrowing or stealing. My own rules may have tied me in a knot. The vansion is booked in to be fixed today. I’ll eagerly await the phonecall telling me the cost of the repairs and asking me if they should go ahead. If the amount is greater than what I have left in the bank, then what do I do? What if I had £150 left in the bank and the repairs cost £200? Do I simply treat that as my £0 point? If so, I can start earning money, earn the extra £50, pay the £200 for the repairs and end up at £0. I’d be following my own rules in the spirit of the challenge, but not following the rules to the letter. Or do I follow the own rules, not just in the spirit of the challenge, but strictly and literally? Since those rules state that I can’t seek work until my bank balance drops to £0, then I’d have to wait until I’d spent my remaining £150 before I’d even be allowed to try and earn money. Then I’d have to wait until I’d earned the whole £200 from scratch before I could repair the van. What do you think I should do? How strict should I be? It’s over a month since I last looked for work. I am self-employed and am deliberately letting my money dry up, to face my fears about running out. 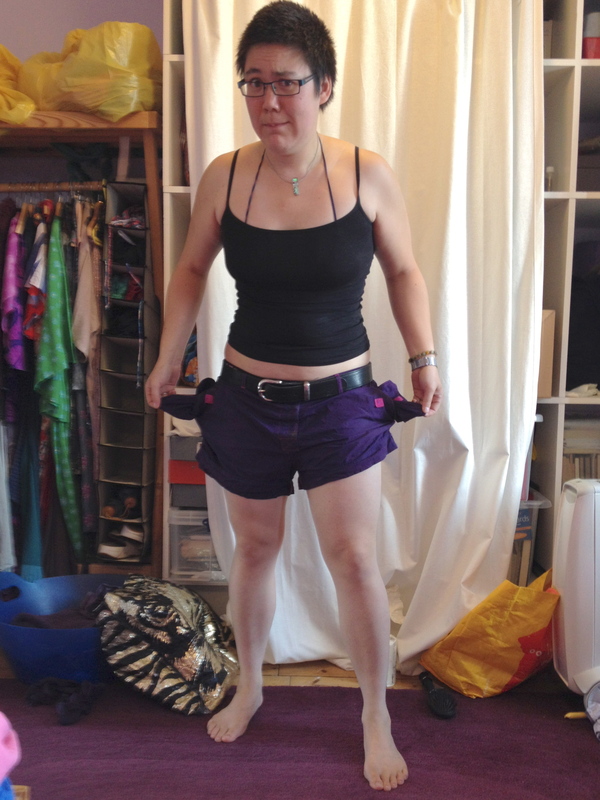 We’re still only in phase one of the experiment – allowing my bank balance to run to £0… and it’s not a zero yet. But am I letting go of my fears about money? Well, a friend played a practical joke on me by putting a fake parking ticket on my van. Despite the fact that the fine would have absorbed around 20% of the money I had left, I was surprised that I had no reaction to the prospect of being fined. When I found out it was a joke, I wasn’t angry either. What strange behaviour! Guess I am changing. Picking up Chris the hitchhiker made a difference too ( https://symphonyforhappiness.wordpress.com/2014/05/25/the-wisdom-of-supertramps/ ). What I didn’t put in my previous post is that 10 minutes before I was due to pull over and drop him off, I said to Chris “Mostly everything I own is in this van. If there’s something you need, ask me for it. If it’s in this van I’ll give it to you”. I surprised myself in saying this, because I knew that I would honour it, even if has asked me for something expensive or important to me. I have so few possessions now that I only keep what’s important to me. But having so little, it occurred to me how much more difficult it might be for Chris to have even less. So whatever he asked for, even if I didn’t immediately have the money to replace it, I had more than him so what did it matter? As it turned out, all he wanted was some food and a tarp. Just to get it straight, I’m not writing about my virtuous behaviour in order to paint myself in a good light, or be the hero of my own stories. In fact, as a Buddhist, it makes me uncomfortable to mention such things. However, I do believe that it’s important for us in the first world to re-examine the concept of money. Cataloguing my personal quest to face my own fears surrounding money is part of my contribution and therefore I feel the need to be honest about how this changes me and share it. 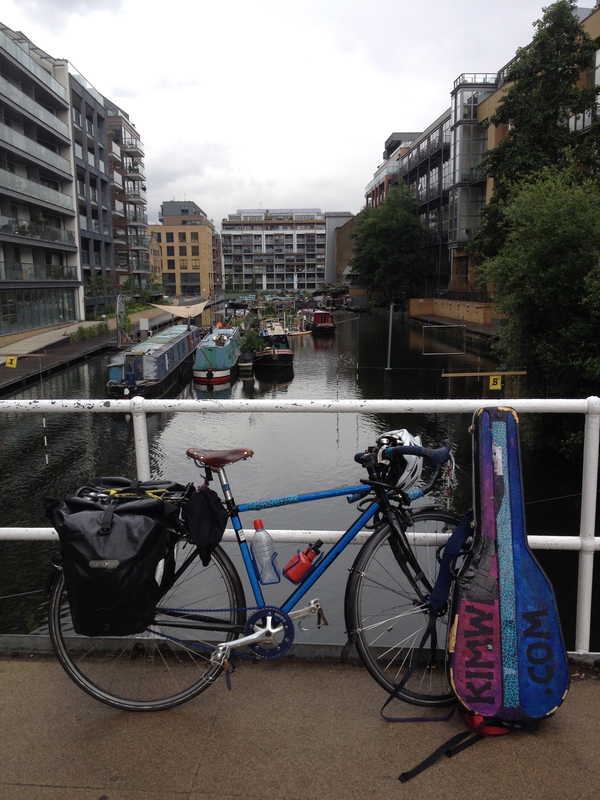 Out and about in London, with guitar and bike. After conceiving the £0 challenge the first thing I did was go on holiday with the intention of running out of money. I went to London, to visit friends whom I hadn’t seen in years. My plan to run out of cash backfired when, being so pleased to see me, my friends wanted to pay for most everything. Even my hosts struggled to accept my contributions towards food, without even knowing about my £0 Challenge. 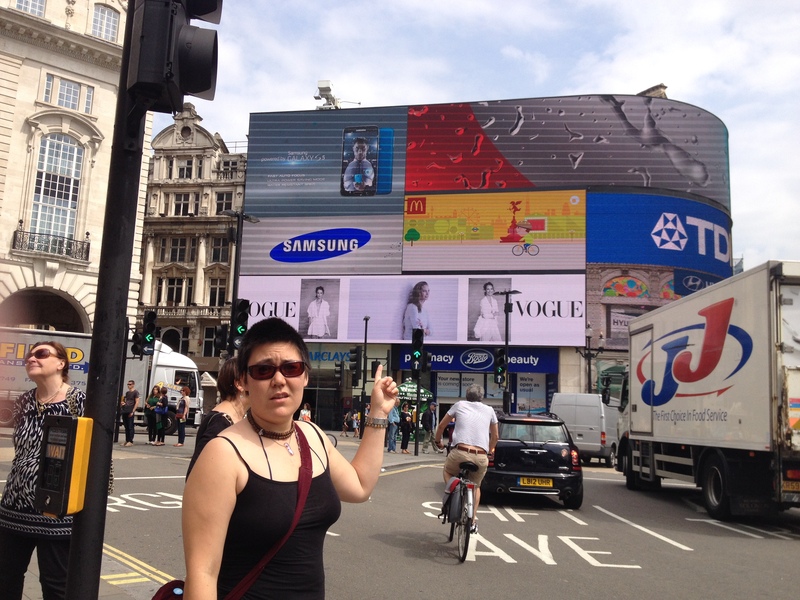 I struggled to spend money whilst out and about by myself because London is so abundant in food waste. Another way I’ve changed is that I’m developing a new resourcefulness, allowing me to operate with less money. My “wombling” skills have increased. One day I forgot my wallet entirely. Hungry at a food court I decided to eat whatever I found that looked safe and intact. Half an hour later, I actually had to stop because I was full, having found 3 half eaten foil containers of chinese takeaway, a bun (still in it’s wrapper), some chocolate, half a fancy cupcake and drunk an unopened bottle of softdrink. Later, when it got cold I found a jumper sticking out of someone’s bin. I wore it all week and then gave it to a charity shop, feeling good about having rescued something that would have gone to the landfill. Standing on the edge of some stuff. The best result of this challenge is that I’ve been forced to come up with a way to make a great music video for free. For years I’ve wanted the money to make a slick music video, but it’s been out of my budget so out of the question. But now, I’ve come up with a great idea for a video for my song “Standing On The Edge”, that isn’t diminished by being low budget – in fact, it works BECAUSE it’s low budget, so anyone with a camera-phone can contribute. Whilst it won’t be “studio quality”, it will be great to watch, get lots of people involved and having fun in the process, and it’s totally free to make. Anyone can be IN my new video – all you have to do is send me some footage, as per the guidelines in this link to the “preview video” I’ve created ( https://www.youtube.com/watch?v=2XNDwS7wUwE ). 14 people have already contributed! So essentially I’m getting bored. A month of holiday was great – travelling around the country, seeing friends and not worrying about having to look for income. But now, I want to release the acoustic album I finished at the end of April, seek gigs, go busking and all that other singer-songwriter/independent musician stuff. But according to my £0 Challenge I can’t do any of those things until my money runs out, because they count as “seeking work”. I suppose I could just make it run out today by buying something I don’t need, or give it to charity, but as already discussed in previous posts, that defeats the point of the exercise. Stills from my “test shoot” for the upcoming music video shoot on June 14th. Thanks to Abi Crisp for giving up her time to film me standing on the edge of stuff. Make music videos – I’ve got a great idea for a music video that you yourself could be in! It’s for the song “Standing On The Edge”, from the album Refraction & Redemption which I’m due to release this year. Be a part of the filmshoot in Exeter on June 14th. Alternatively, you can send in your own footage from anywhere in the world. See the event page for more details ( https://www.facebook.com/events/1458751301038571 ) or facebook PM me if you’d like to contribute remotely. Make a CD of acoustic covers that I could sell when I do go busking later this summer. Update my website (kimwei.com) which I’ve just stripped down. I might even replace the section about my recording studio and production services with a whole new “Goldflower Studios” website, since it was getting a bit to big as my production portfolio has grown over the years. Design album cover for my new album, soon to be released. Write (but not launch) my Kickstarter page in order to release said album. For those of you who don’t know what kickstarter.com is, it’s a website which provides a great framework for an independent album release (among other things). Basically, you sponsor me as an artist by donating money – any amount. For a small donation you’ll be sent the new album as a thankyou. Sounds just like buying the album online right? Not quite. Because you can pledge any amount and there are many rewards to choose from. For example, a signed original lyric sheet (complete with crossing outs, missing verses etc), or a £100 might gain you a living room gig with the artist, in which you can pick your favourite songs. Some bands even include the guitar strings that were used to record the album, as a reward for a certain donation. I’ve still got mine on the guitar so that’s easily done. The artist uses the kickstarter money, either for a specific music project, or simply to keep on making music.